Coloratura is a transmedia project combining the disciplines of visual art and music by using paint brushes as MIDI controllers that can create and manipulate live music. The interface is composed of 12 paintbrushes, each assigned to a unique color and a unique musical note. Color and sound emerge as one, providing the audience with a multi-sensory experience. Every performance has a unique piece of music and a unique piece of art as the end result. The initial catalyst for creating Coloratura was my desire to incorporate visual design into my performances as fluidly and spontaneously as I create my music, and to interact and respond both visually and musically to changes in the audience, the venue, or the elements. Coloratura’ is an Italian term that literally means “coloring” or “to color”. In the musical world, the term is used to refer to vocal trills and ornamentation used by classical/operatic singers. Many of the terms we use in reference to art or music (e.g. chromatic, form, harmony, scale, composition, texture, tone) overlap both disciplines and the name of this project reflects this relationship. Electricity! 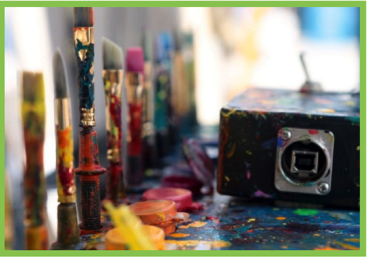 Each paint brush is wired to a circuit board that connects wireless to a computer. Each brush is assigned to an individual note in the musical scale; when a brush touches the canvas, it triggers a note on the computer. I’m using the music production program Ableton to add various effects to the notes and to loop multiple musical phrases on top of each another. For most of my life, my primary artistic focus has been music, but I’ve always been interested in the relationship between visual art and music. I am fascinated by people who have synesthesia–people who are able to see sounds or hear colors. I don’t have synesthesia, but I developed Coloratura as a way to recreate this phenomena and create my music in an innovative way. Ultimately, I want to connect with my audience and provide them with a multi-sensory dynamic experience that will make them think deeply about the parallels between color and sound. Is there a reason why C is green and Eb is blue? Yes! Determining the color of each note was one of the most difficult parts of this project! When I began developing Coloratura, I used a scale developed by Alexander Scriabin. As I was painting, I found that some of the most beautiful color schemes sounded horrible when “played” together, and some basic chords looked hideous when interpreted visually. I wanted to find a scale that would create a beautiful balance in color and sound. After a great deal of trial & error, I decided to use a modified color/music scale, based on a system developed by artist Steve Zieverink. Of all the scales I researched, it was the most visually and musically harmonious. Can you bring Coloratura to my house/office/performance space/party? Probably! Send me an email at camryivory@gmail.com and we can discuss details. What are your future plans for this project? How can I get involved? I would love to see more visual & performing artists incorporating Coloratura into their practices to create unique works of art. I’m also interested in developing Coloratura as a tool for art therapy, since it has served such a therapeutic role in my own life. In order to accomplish these goals, I’m actively seeking out people in the art, music and STEM fields who can provide technical support, research and development ideas, performance opportunities, networking opportunities, or financial assistance. If you’re interested, please email me at camryivory@gmail.com.